Managing VirtueMart 1.1 Manufacturers, Vendors, and Product Categories can be quite confusing the first time. 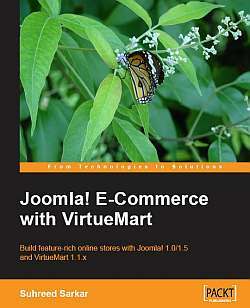 But thanks to Packt Publishing I can publish the relevant chapter from "Joomla! E-Commerce with VirtueMart" by Suhreed Sarkar. This is an extract from Chapter 4 Managing product catalog. We are going to add and edit a lot of information for manufacturers, vendors, and product categories. Actually, in this article, our VirtueMart shop will really take shape with products we want to sell. The product catalog for an online shop comprises of the products we sell in the shop. Whatever products we want to sell should be added to this product catalog first. Once products are added to the catalog, customers can browse the products and decide to buy whatever they need. Therefore, managing the catalog is one of the primary tasks of the shop owner. Products that we add to the catalog need to be organized to help customers easily find the right products. In VirtueMart, customers can sort the products by product categories and manufacturers. Therefore, before adding products to the catalog, we will look into managing manufacturers and product categories. In VirtueMart, whenever we add a product to the catalog, we also need to assign a manufacturer for that product. In reality, every product has a manufacturer, and for better management of the shop, we should be able to find products by their manufacturer. Therefore, first step will be to identify the manufacturers and enter their information in VirtueMart store. We can also categorize the manufactures as publishers, software developers, and so on. There is a default manufacturer category for use in VirtueMart. We can use that default category for creating a manufacturer. However, when we are selling large number of products from a large number of manufacturers, classifying them into categories will be convenient for managing the manufacturers. In the Manufacturer Category Form, provide information for the Category Name and the Category Description fields. Once these are provided, click the Save icon in the toolbar to save the manufacturer category. In the same process, you can add as many categories as you want. In the Add Information screen, type the manufacturer's name, their URL, email address, and a brief description. In the Manufacturer Category field, select the category. The drop-down list will show the manufacturer categories you created earlier. Once all the information is provided in this screen, click the Save icon in the toolbar to save the manufacturer information. In the Manufacturer Category List screen, you will see all manufacturer categories you have created. From this screen, you can add a new category by clicking the New icon in the toolbar. Similarly, you can remove a category by clicking on the trash icon in Remove column, or by selecting the categories and clicking the Remove icon in the toolbar. You can edit a category by clicking on the category name. From the Manufacturer List screen, you can create a new manufacturer, remove one or more manufacturers, and edit any manufacturer. For editing a manufacturer, click on the manufacturer's name or the Update link in Admin column. This will bring up the Add Information screen again. You can also create a new manufacturer by clicking the New icon in the toolbar. From the Manufacturer Category List screen, you may think that clicking on the Manufacturer List link against each category will display the manufacturers added to that category only. Ideally, this should be the case. However, until VirtueMart 1.1.2, it shows the list of manufacturers from all the categories. We hope this will be fixed in the upcoming releases of VirtueMart. The idea of multiple vendors is something what you can see on Amazon.com. Different vendors add their products to sell, when the order is placed, the store notifies the vendor to fulfill the order. The main store usually gets a commission from the vendor for each sell made through the store. However, VirtueMart's vendors feature is still in its infancy and does not yet function properly. You can add multiple vendors in VirtueMart, and assign products to the vendors. However, adding vendors has no effect on selling any product on the VirtueMart store, except when applying different vendor-specific tax rates and shopper groups. At the moment, it also helps to identify products from different vendors. In the following sections, you will see how to add and manage vendors. In the Vendor Category Form, type the name of the category and its description. Then click the Save icon in the toolbar. You can add as many categories as you want. Before trying to add vendor categories, first plan how you are going to categorize your vendors (for example, based on the product they sell or their location). Have a full category tree on hand and then start creating categories. Note that there is a warning sign at the top of Add Information screen. It warns you about using the vendor feature as it is in the 'Alpha' or pre-mature stage. Also note that we have used Simple Layout for displaying it. If you try adding a vendor from Extended Layout, you will open up an edit screen for existing vendor information, which you already added during the initial configuration of the shop. Up until VirtueMart 1.1.2, a bug has been encountered and which will hopefully be fixed in future releases when it crosses 'Alpha' stage. The Add Information screen shows three tabs: Store, Store Information, and Contact Information. From the Store tab, add the vendor's store name, company name, logo, web site URL, minimum purchase order value, and minimum amount for free shipping. You can also configure the currency symbol, decimal points, decimal symbol, thousand separator, positive format, and negative format. In the Store Information tab (seen in the previous screenshot), you can add the address of the store, city, state/province/region, zip/postal code, phone, currency and vendor category. The vendor categories you have created earlier will be available in Vendor Category drop-down list. In the Contact Information tab (seen in the previous screenshot), you can set the contact details of the vendor, such as name, title, phone, fax, email. You can also add a brief description of the vendor which will be displayed in the vendor details page in the store. Type a brief description in the Description rich-text editing box. In the Terms of Service rich-text editing box, provide terms of service applicable for that vendor. Once information in all the three tabs are provided, click the Save icon in the toolbar to add the vendor. In the Vendor Category List screen, you can see all available categories. You can add a new category by clicking on the New icon in the toolbar. Similarly, you can delete any category by clicking the trash icon in the Remove column. For editing a category, click on the name of the category in the Category Name column. Clicking on the List link will show the vendors in that category. You can view the list of vendors from the Vendor | List Vendors. This shows the Vendor List screen (seen below). Like the Vendor Category List screen, you can create a new vendor by clicking on the New icon in the toolbar. You can also delete a vendor by clicking on the trash icon in the Remove column. For editing a vendor, click on the vendor name link in the Vendor Name column. As the vendor feature is still in a pre-mature stage, some of the links don’t behave as intended. For example, clicking the List link doesn't show the list of vendors in that category. Instead, it shows all of the vendors. These could be fixed through editing some of the .php files specific to this functionality. Products in a shop are categorized for easy searching and for the convenience of the customers. Therefore, when you are planning your shop, also plan how you are going to categorize the products you sell. For our store example, we will divide the products into the following categories: Books, CDs, DVDs, Accessories, Souvenir, and Coupons. Additional sub-categories will be under these categories. Building a well planned category tree, and adding products to the appropriate categories, is one of the best practices for catalog management. In VirtueMart, you can use multiple product categories which can be nested. Before trying to add product categories, you should also prepare the images to be used for each category. Publish: Check this box if you want to publish the category you are creating. By default, this is checked. Uncheck it if you don't want to instantly publish it. Category Name: Provide a brief name for your product category in this field. You must type a name for the category. Category Description: Type a brief description for the category in this rich-text editing field. You can use rich HTML formatting here. The category description should be something that helps customers to understand what's in that category. ListOrder: You will find this field disabled while creating a new category. When you create a new category, it will be listed at the end. However, when editing the category, you can change the order in which the categories will be listed. A lower number in this field will place that category in upper position. Parent: This field allows categories to be nested. If you want to make the new category a sub-category of an existing category, select that existing category from this drop-down list. Show x products per row: Specify, for this category, how many products will be displayed in a row. Category Browse Page: For each category, you can specify a browse page for showing particular information about the products in that category. Category Flypage: For each category, you can specify a different flypage, which displays product details. For example, for the Books category, you may want to show the product details differently. Therefore, you design a flypage for that category and assign that to the Books category. In the Images tab (seen below), you can assign an image for the product category you are creating. You can upload a full image and select the Auto Create Thumbnail option to create the thumbnail from the larger image. Otherwise you can upload a thumbnail image separately. You can also specify the URL of the image in URL field. When all of the information is provided in both of the tabs, click the Save icon in the toolbar to create the product category. Add as many product categories as you want. In the Category Tree screen, you see the list of all product categories you have created. This list also shows category nesting, its description, number of products in each category, whether the category is published or not, and their list order. You can also create a new category from this screen by clicking on the New icon in the toolbar. For removing multiple categories, select the categories by checking the checkbox left to the category name and then click on the Remove icon in the toolbar. For removing a single category, click on the trash icon in the Remove column. When you remove a product category, all products under that category will also be deleted from your store. Therefore, be careful about deleting any category. If you really need to delete any category, first move the products in that category to another category. Otherwise, you will lose all the products in that category. In fact, you don't need to delete any category. If you don't want to show any category in the store, you can simply unpublish it. You can also publish or unpublish any category. For publishing or unpublishing multiple categories, select those categories by checking the checkbox left to the category name, and then click the Publish or Unpublish icon in the toolbar. For a single category, you can click on the icon in the Publish column to publish or unpublish that category. A green tick icon in the Publish column means the item is published. A red circle with a white cross inside means the category in unpublished. When a category is unpublished (including its sub-categories), the products under the category are also not visible in the store frontend. However, some modules, such as Featured Products, Random Product, and Top Ten Products, may display the products under those unpublished categories. For editing any category, click on the category name. That will open up the same Category Information screen, which you have used for adding a category. In this article, we have laid the ground work to build a product catalog for our VirtueMart shop. We explored adding manufacturers, vendors, and product categories. Also we covered listing the manufacturer categories, managing vendors and categories, and modifying product categories. He has taught courses on System Administration, Web Development, E-commerce, and MIS. He has consulted for several national and international organizations including United Nations, and helped clients build and adopt their web portals, large scale databases, and management information systems. At present, he is working on building a framework for the education sector in MIS, and promoting use of ICTsin education. Suhreed is a renowned technical author in Bengali—having a dozen book published on subjects covering web development, LAMP, networking, and system administration. He authored Zen Cart: E-commerce Application Development, published by Packt Publishing. When not busy with hacking some apps, blogging on his blog (http://www.suhreedsarkar.com), reading the philosophy of Bertrand Russell or the management thoughts of Peter F Drucker—he likes to spend some special moments with his family.